If you have been following this series from the beginning, hopefully you have built your own Auduino Granular Synth and enjoyed many fun filled hours making noise. The Auduino circuit was designed to be a quick and easy project that you could slap together with a bare minimum of parts. Because of this, there are some areas of the design that have room for refinement. The audio output of the synth comes directly from a Digital Pin on the ATMega chip and as you may know, these pins output a 5 Volt signal. Most audio amplifiers are expecting a peak-to-peak signal at a level closer to 1 Volt. This is referred to as Line Level. The official Auduino website addresses this issue by stating "Strictly speaking, it outputs at 5V rather than the 1V line level, but most amplifiers don't seem to mind". So basically, if you are happy with the way the circuit is working, read no further and enjoy it. As for myself, being the compulsive tinkerer that I am, I wanted to see if I could make the output of the synth a little more well-behaved. After a bit on searching, I found a filter circuit on the Munich Maker Lab page that looked promising. It is a simple circuit consisting of two capacitors and a resistor. I built up the circuit and connected it to the output of my Auduino and was pleased when my oscilloscope showed a signal level much closer to line level. There was only one problem, the "personality" seemed to have been removed from the synth. The original Auduino circuit has some really aggressive high end that produces some wonderfully obscene sounds when you sweep the pots in the upper registers. With the filter circuit in place, the synth was far more polite and bland. I started modifying the circuit and found that by lowering the value of the 100nF capcitor, the high frequency magic would re-appear. After much tweaking, a 33nF cap seemed to be the sweet spot for the circuit. Hello, I know this is a bit of an older article but I am thinking about building a couple of these. With that said I am far from an electronics engineer so I am asking this with little knowledge about what all the components do. Is there an adjustable circuit that could take place of the 33nf Film Capacitor? I am thinking that if one was able to adjust it during play it might work to kind of be like an LPF? Just a thought. It's an RC LPF so you won't get any feedback or self-oscillation from it. 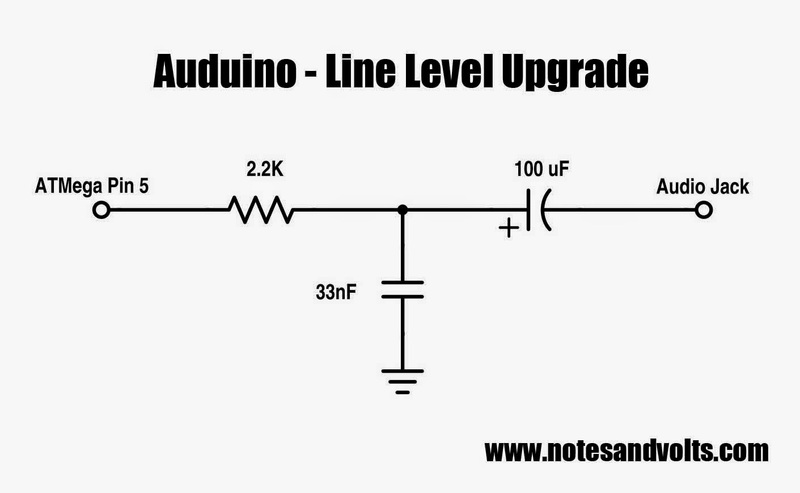 The line-level upgrade might be vital in other Arduino/audio applications. I naively built an FM synth on an Arduino (using Mozzi Library), and during a gig one of my speakers caught fire!